I love spending time with Olive out on adventures or playdates. Even going for a walk down the road. But my most favourite parts of the day are when we're at home together, first thing in the morning- a fresh new day or last thing at night- winding down. These parts of the day are spent sitting in the reading corner or snuggled on the sofa with a pile of books beside us and we read together. Olive loves books more than she loves raisins (well, maybe equal parts!). She has her firm favourites which she almost always asks me to read first. 'Paper Dolls', which is a stunning book! 'Please, Mr Panda', Peter Rabbit (we have a few variations, all of which she adores.) and 'Hop Along Boo, Time for Bed', which is the book we always read before bed. 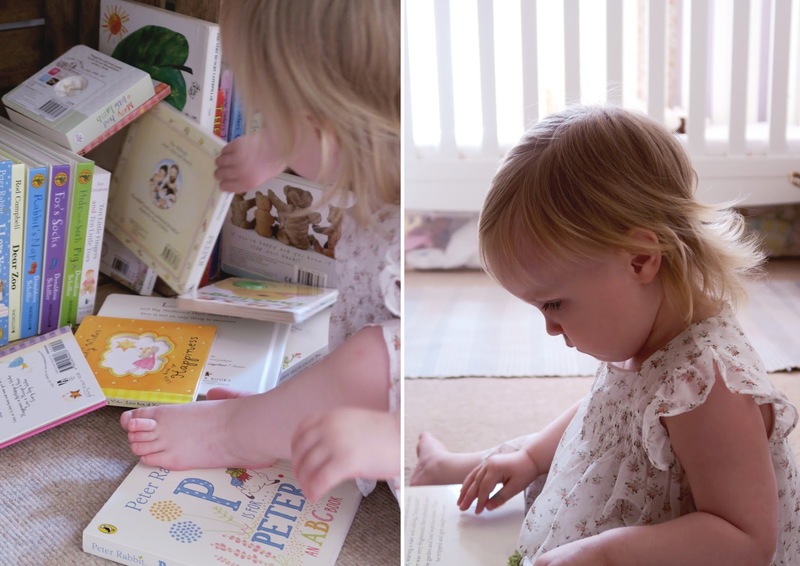 She also loves the classics 'Peepo', 'Each Peach Pear Plum', 'The Hungry Caterpillar','Ten little Fingers and Ten little Toes', 'We're going on a Bear Hunt' along with the contents of her bookshelf. I too enjoy reading all those books to her. I read part of the sentence and let her finish it - we read them THAT much. I believe this is one of the reasons why Olive's vocabulary and memory is phenomenal. Repetitiveness and reading. My other favourite pasttime is watching her read by herself. Sometimes she just sits in her reading corner and takes out each book, carefully inspecting each page before getting the next one. It always looks like she's in a sea of books by the time I come back and check on her. Other times I hear her (and secretly watch her from afar) reading out loud. It's mostly gobbledegook with the odd word thrown in. It's so funny and wonderful to watch. A few weeks ago I was going about my weekend morning getting some housework done and Olive just sat here for ages in her sea of books with her beautiful floral dress. The sun was peering through the cracks in the curtain, it was such a pleasant and warm morning. The perfect kind for nibbling on strawberries in your favourite party dress whilst reading books. What a way to start the day! The beautiful dress* was kindly sent to us from the lovely ladies at Mama et Moi. The pretty rose print is such a delicate print on this delicate floaty dress. It is a traditional design with girly elements. I love the little frills on the shoulders too! Oh and the ruched bodice! I just love it all. Olive doesn't often wear dresses but when she does she twirls around and you can tell she feels girly in them. She is adorable. 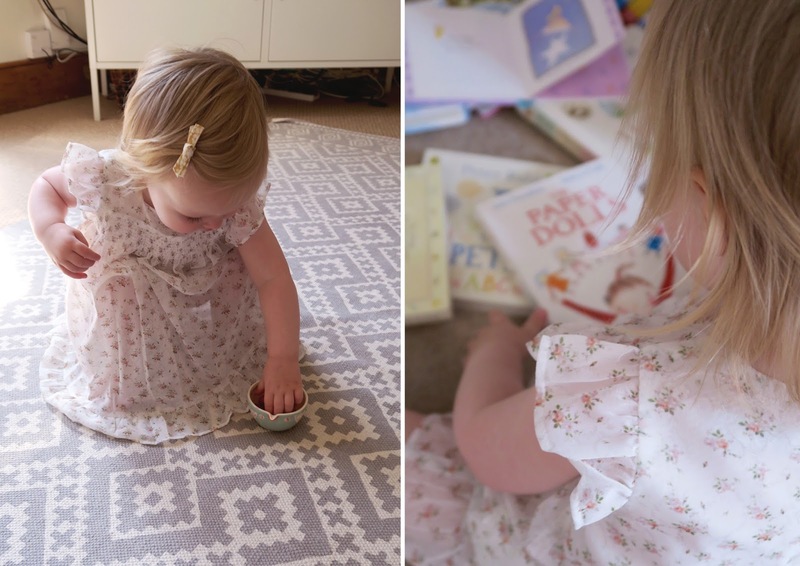 With her books, her dreamy dresses and strawberry stained chin I honestly can watch her play all day. Though she would stop after a while to beg for "mor snaacks Mammy?!" "Yer peeease" and to play with her wooden blocks and plastic fairies or running over to the window to see which "Nee-Norrs" is driving past with it's siren. What a lovely post! That dress is gorgeous on her. It's great to see that she's getting into books; I remember going to the library every week with my parents when I was little, which is a habit that has really changed my life.